Join CODEPINK for May Day in Cuba: April 26 — May 3, 2015! There’s nowhere on Earth better to be on May 1st than Cuba! Don’t miss the opportunity. Due to the huge success of our February 150-person “To Cuba With Love” CODEPINK decided to organize another trip–– this time to coincide with May Day, a day when hundreds of thousands of Cubans come out in the street to celebrate International Workers Day. We hope to bring 100 people, which allows us to have multiple itinerary options so you can customize your own experience. "A trip with CODEPINK to Cuba guarantees an amazing depth of understanding,behind the scenes opportunities, and a level of insight and solidarity with the Cuban people unheard of with regular tours. 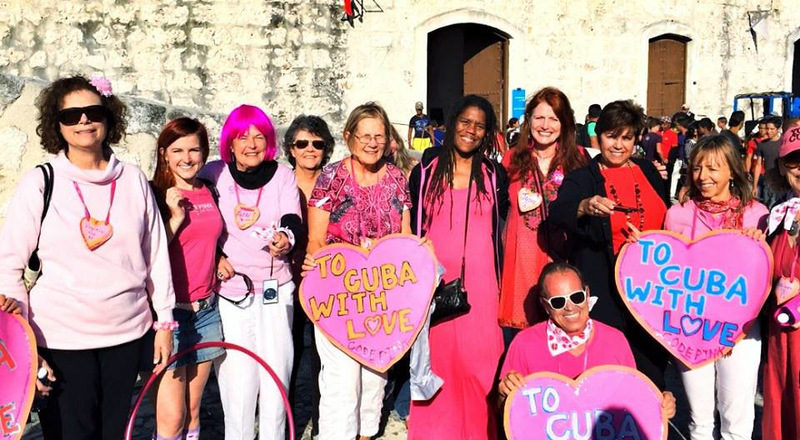 You owe it to yourself, your community and your worldview to travel to Cuba with CODEPINK!" The group will meet with government officials about US-Cuba relations, look at Cuba's changing economy moving away from state-run enterprises to cooperatives, talk to doctors from around the world being trained in Cuba, visit cooperative farms, take day trips outside Havana, and interact with local people about cultural, economic, environmental and health issues. Check out testimonies, photos and press coverage from our last trip. There’s nowhere on Earth better to be on May 1st than Cuba! Don’t miss the opportunity. The Cuban people are so wonderful--fun, funny, inventive, creative, well-educated, curious and they have a zest for life that rival any. So join us, and mark history with a mojito, the world's greatest music, and a most-welcomed dose of love for our neighbors. The price of the trip from Miami is $2,000 for a double room, $2175 for a single room. There are limited single rooms, which we will give out on a first come, first served basis. If you are willing to have a double room but don’t have a roommate, we will pair you with someone. We have 80 spaces available and time is short. Please fill out this delegate application and make a non-refundable deposit of $500 by March 30th. We cannot hold a place for you without a deposit. Send a check (made out to CODEPINK) to CODEPINK, 1241 Evarts St. NE Washington, DC 20018, (and then inform Nalini@codepink.org so we can mark you as paid), or pay online HERE. **Important** if you pay online, you must pay $520 (an extra $20) because of a 4% online bank fee. For more information, contact Nalini@codepink.org asap. We hope you can join us for Primero de Mayo! Can't make it? Please consider making a donation to our trip scholarship fund.